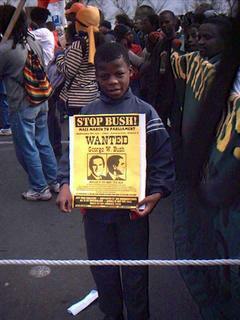 South Africa 9 July 2003 - US President George W Bush has been greeted in Capetown by demonstrators enraged at US politics towards Africa and the World. Bush is on a tour of several African nations and has been received today by South African president Thabo Mbeki. According to a BBC report President Bush highlighted the fight against Aids. He praised efforts to tackle the disease in South Africa, which has the largest HIV-infected population in the world. "America is willing to put up the resources in the fight," he said. President Mbeki has taken a courageous stand on the AIDS issue, says Anthony Rees, director of Education and Research at the HONERI Institute in South Africa. At the international AIDS summit held in Durban in 2000, Mbeki had ignited a firestorm of criticism by asking dissident scientists including Peter Duesberg, who questioned whether HIV causes AIDS to advise him on the epidemic. Subsequently, South Africa took a firm stand against the pharmaceutical multinationals over royalties for the production of life saving drugs. Just days ago, Mbeki was informed by Rees of a complaint filed before the International Criminal Court in The Hague which accuses Bush and some of his closest collaborators of crimes of war. The directors of multinational pharmaceutical companies including Pfizer, Merck, GlaxoSmithKline, Novartis, Amgen and Astra Zeneca are also named in the complaint charging they deliberately prevented life-saving natural alternatives to drug based treatments from being applied in prevention and cure of mankind's great "killer diseases". According to the BBC report, Bush and Mbeki "emphasised their points of agreement", rather than their differences. 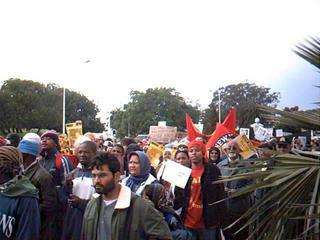 Anthony Rees reports about the Capetown demonstration. 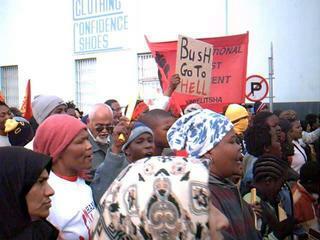 Today, Cape Town mobilized and held a rally against the arrival of George Bush. I have included some selected pics of the rally which I took. I was able to get a spot on the podium in front of Parliament and briefly talk about how we must support Mbeki against the pharmaceutical-cartel and stop Bush in his efforts to protect his criminal cronies from the International Criminal Court. I think people took the message to heart, and it looks like we can very easily get a whole new support base in this struggle from this departure point. I could not get any pics on me on the podium, as my camera battery was flat by the time I got to speak. Herewith is a chronological summary for the record. At 10:00am the people met at renowned 'district Six' a place where the Aparheid Government of the old South Africa forcably removed black and coloured people from their homes. This is historically a very sacred place to South Africans - a place of struggle. 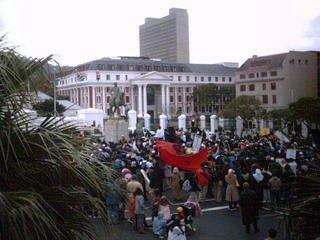 People from all walks of life join the new struggle in South Africa. 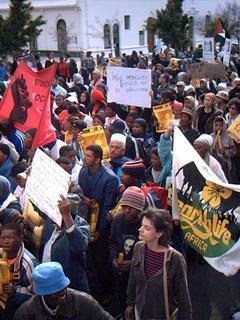 This time, its not apartheid, its Neo-Colonialism, and George Bush's 'New World Order'. 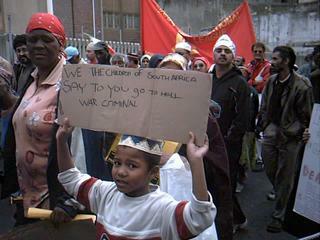 A member of the South African youth lets us know who is the enemy of his future. 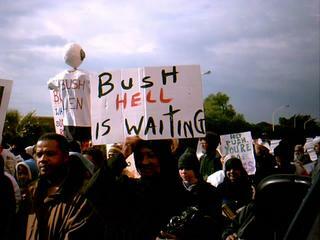 The Rally represents a cross-cultural mix of people with solidarity against the Bush supported cartels. well, how if we called him a fucker. and we grab our heart to kill him someday. No, you are falling into a trap there. He does deserve to pay for what he did but it is not for anyone of us to kill him. It's the Americans who need to realize what is going on and vote him into a place where he can do no further harm. See the variety of comments on this moving image, which someone has made of Bush. The spirit of man can only be silenced by fear. The strength of fear is ignorance. The strength of the spirit is regognition.